Home > Campus News > The HR Pathway! 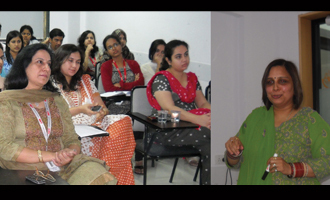 MET Schools of Management orgainsed a session on ‘Career Options in HR’ by Ms. Aparna Sharma, Director HR, UCB (India) Pvt. Ltd. on Feb.4, 2010. She addressed on the struggle and status of HR professionals in the corporate world. She also defined and distinguished between the HRM (Human Resource Management) and HRD (Human Resource Development).